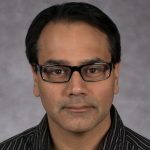 Dying to know? Then read on. 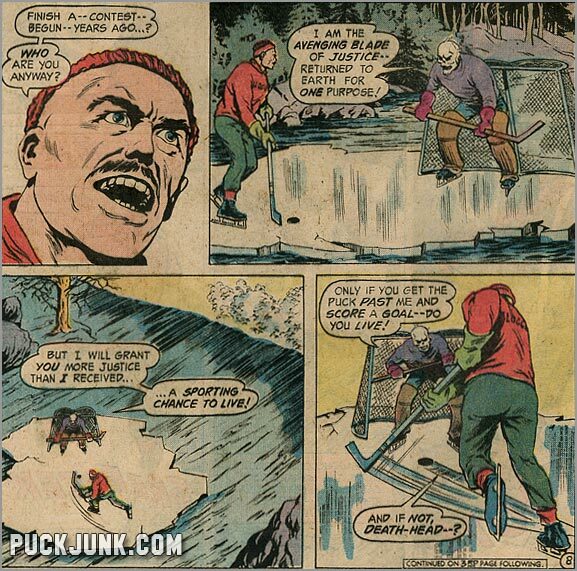 The issue starts out with two men playing hockey on a floating sheet of ice, teetering on the edge of a waterfall. 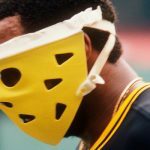 One of the men is wearing 1970s-style goalie mask — but creepier, as if Gerry Cheevers’ mask mated with the mask of Ghost Face from “Scream”. 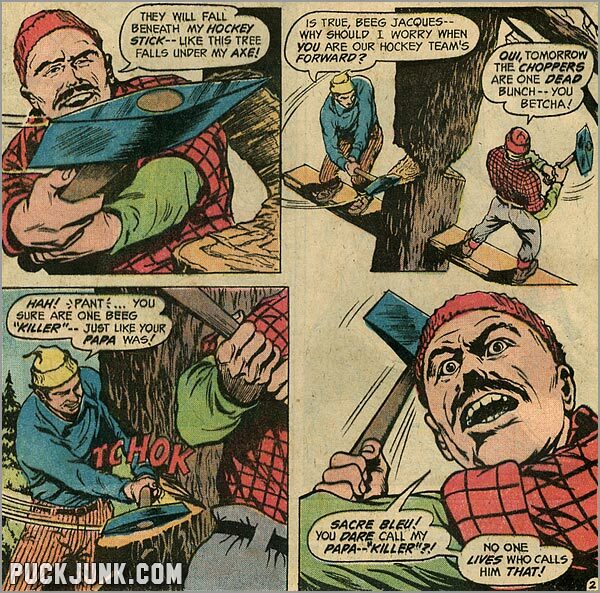 We then cut to a scene where two lumberjacks are chopping down a tree. Here we meet Jaques, the focus of the story. 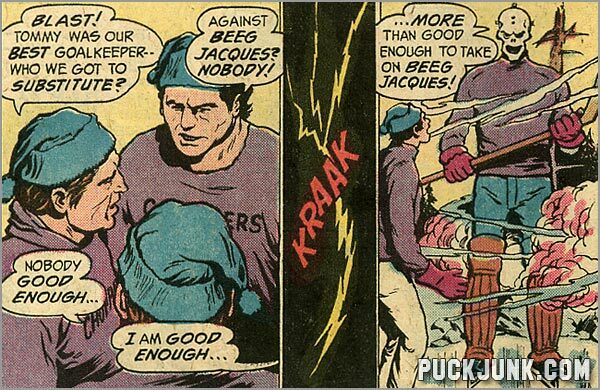 Everyone calls him “Beeg Jaques”, as in “Big Jaques” but with a French-Canadian-speaking-English sort of accent. Anyway, Beeg Jaques and the other guy — Georges — are talking about their upcoming hockey game against a rival group of lumberjacks, known as “The Choppers”. 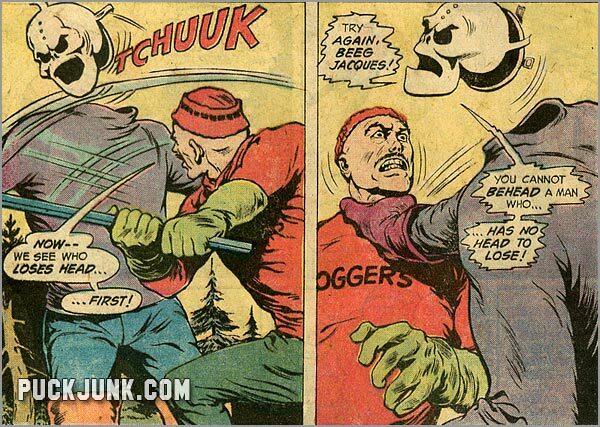 Jaques is quite confident that their team — the aptly named Loggers — will win, as he is the team’s star forward. “Oui, tomorrow the Choppers are one dead bunch — you betcha!” proclaims Jaques. As a side note, this may be the only time the words “oui” and “you bectcha” have been used in the same sentence. Georges makes a comment about how Jaques is a “killer–just like your Papa was!” Bad move. You see, Jaques’ Papa was accused of beheading his partner years ago, but they never proved it. In fact, the body was never found (eerie foreshadowing). Understandably, Jaques gets pissed, and beheads Georges, hiding his body in a hollowed out tree. Later, Jaques lies to his fellow lumberjacks, saying that Georges quit and went to Alaska to become an oil prospector. But no one really seems to care, as they are too concerned with the upcoming hockey game. The next day rolls around, and the game begins — Jaques and his Loggers against the Choppers. The teams take to the ice, playing on a frozen river. Many of the men have bet several months of their salary on this game, as Beeg Jaques can apparently carry his team to victory. He accomplishes this with a blend of hockey skills and dirty play, spearing one player and taking out the Choppers goaltender. The Choppers get worried, because no one else on their team is good enouh to stop Beeg Jaques. Then the story gets…wait for it, wait for it…STRANGE! 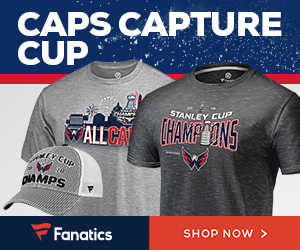 Lightning strikes the ground, and out of nowhere a seven foot tall man — with a sinister goalie mask — volunteers to play goal for the Choppers. 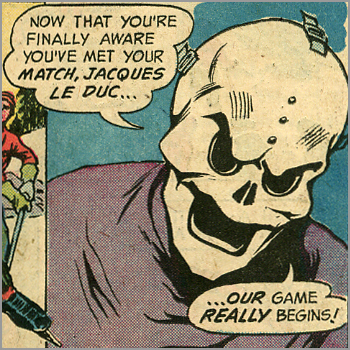 The “Ghostly Goalie”, as he is referred to, then proceeds to stop every shot that Jaques fires at him. But then, things get even STRANGER! Lightning strikes the ice, fragmenting it so that Jaques and the Ghostly Goalie are isolated from the rest of the players. Their chunk of ice flows down the river, away from everyone else, and towards a waterfall. Despite putting up a grand effort, Beeg Jaques can’t beat the sinister netminder. Nearing the edge of a waterfall, Jaques knows that his time is up. 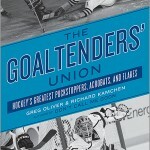 So he deiced to whack the goalie in the head with his hockey stick — but it is useless, because the goalie has no head! “You cannot behead a man who…has no head to lose!” proclaims the goalie, as he and Jaques tumble down the waterfall to certain death. 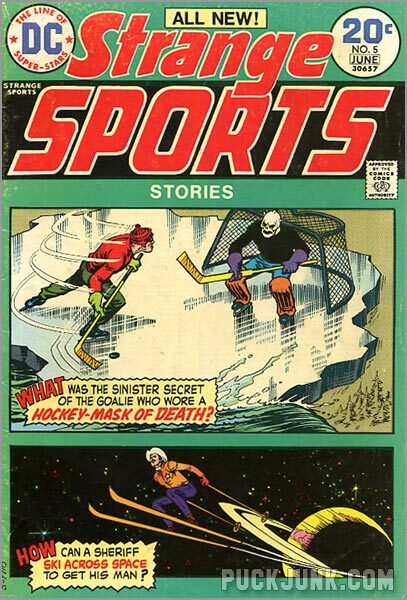 After reading this, I think the comic book should have instead been called “Stupid Sports Stories”. Basically, Jaques gets killed by the headless body of the man who Jaques’ father killed. 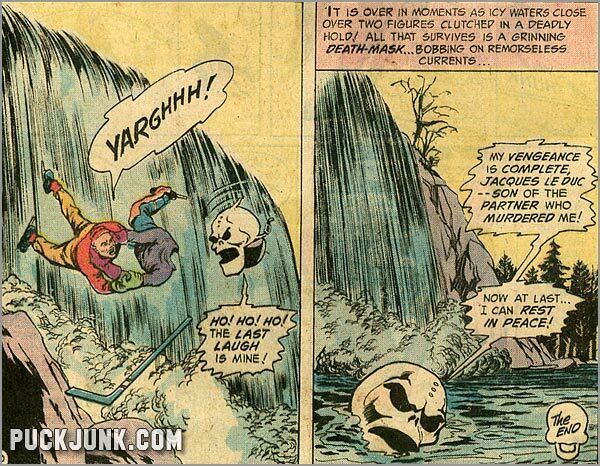 Which begs the question…what about the guy that Jaques killed back on page three? 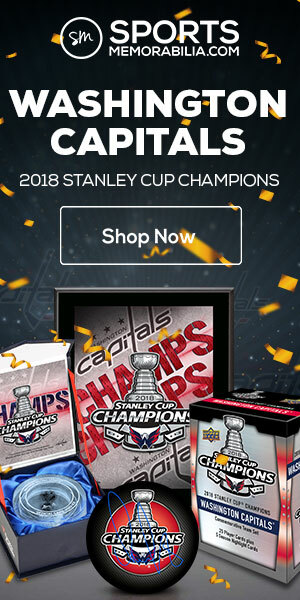 When does Georges get his revenge? And what if Beeg Jaques turned out to be a great guy — and not a murdering, thuggish prick? 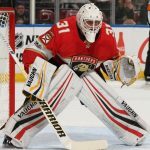 Would the evil goalie still want to kill him? Would you want to kill the son of your enemy, even if the son was a good person? 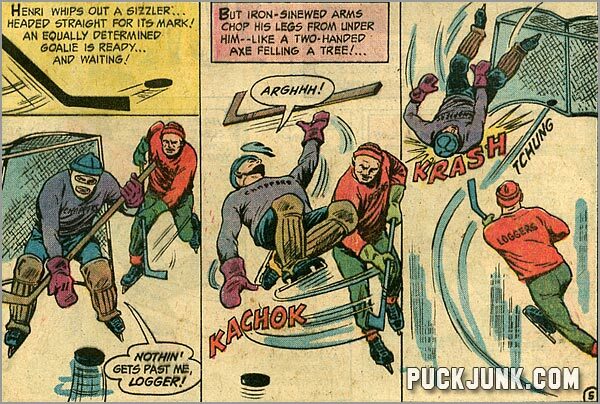 Lastly, this comic seems to have been written and drawn by people who knew nothing about hockey. Everyone is wearing figure skates (! ), and no one seems to know the proper way to hold a stick. Ugh! I’ve spent way too much time thinking about this comic book. This is quarter bin material at its finest. 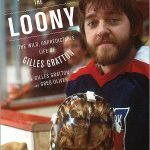 To answer the question of if the goalie would have killed Jacques had he been a nice guy; notice that the goalie did not appear until after Jacques killed his partner. Up until this time, while Jacques may not have been a nice guy, at least he was not a murderer. Jacques killing his partner sealed his fate. Excellent point, Ralph. Thanks for commenting. Any such story is open to interpretation. Granted, this was not the greatest story I’ve ever read, but I did read it when I was 15. I thought it was okay. OMG! I have been looking for this since 1970-something! You win the entire interwebs today! I HAD this comic book, but like so many of us, our parents moved around, things got thrown out, and here we are: Happy again! Thank you thank you thank you! Carl, glad that I could help.